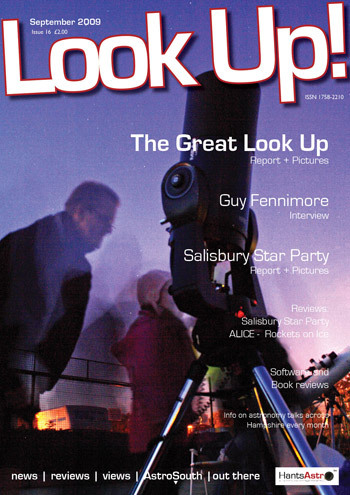 HantsAstro.org- Look Up! The free eZine Next Month! Look Up! free eZine - Subscribe for pre-release! When you subscribe to HantsAstro you instantly become a member, It's free to join and you gain access to invitations for events and observing nights. Subscribers receive the eZine early before it goes online - to plan the month ahead! Sept 09 - Look Up! Look Up! our Electronic Magazine is published monthly in the UK: ISSN 1758-2210. More information can be found in Look Up!, where there are more details on our plans and progress. Registration is free (and easy...) for observing with HantsAstro, just download our simple PDF membership application form, save it to your PC, fill in the form on-screen, save and e-mail it back to subscribe@hantsastro.org. Or print it off, write and pop it in the post. Join today, It's really costs nothing to join in!